Airfares to Europe are quite enticing at the moment, but traveling to that continent could introduce you to more than just the sights. Many European countries are dealing with measles outbreaks according to information released by the World Health Organization on Wednesday. At least 6,500 cases of measles have been reported in a dozen countries so far this year, nearly 5,000 of them in France alone. Most of the people who got the disease in France were not immunized with the measles vaccine, according to Dr. Rebecca Martin, who heads the Vaccine Preventable Diseases program for the WHO's European Region. "About 30% are seen in cases [in France] too young to receive vaccine." Martin says a substantial number of adolescents have also been infected and one adult died from the disease. 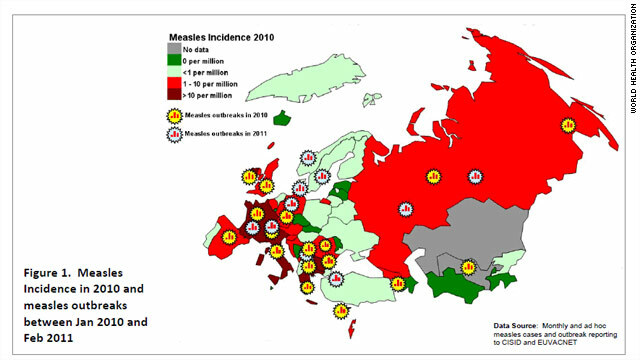 Denmark, Germany, the Netherlands, Norway, Serbia, Switzerland, Serbia and Turkey have also reported cases of measles in 2011, according to the WHO. Bulgaria's measles cases seemed to have peaked, according to Martin. "We had a very large outbreak starting in April 2009 in Bulgaria through 2010 with over 24,000 cases and 24 deaths," she says. British Health officials also continue to see cases of measles this year. 53 cases have been confirmed in England and Wales, of which several have been traced back to travel to the continent. "People don't think measles is a severe disease, but it is a severe disease, there are complications and death can occur," Martin tells CNN. "We see many reasons why people aren't vaccinated, but the result is the same – people are getting the disease," she says. In Bulgaria, many of the cases are among the ethnic Roma population, which often has limited or no access to regular health care services. Belgium has recorded at least 100 cases so far in 2011 (it had only 40 in all of 2010) and many of the cases are traced back to anthroposophic communities near Ghent, which believe it's better to experience a disease than to get vaccinated, says Martin. She says France's outbreak is probably attributable to a lack of vaccination due to the persistent notion that the measles, mumps, rubella vaccine is harmful. "The vaccine is a safe vaccine," she says – adding that the disease is much more severe than any possible side effects that might be caused by the vaccine. "It does lead to death." Dr. William Schaffner chairs the Department of Preventive Medicine at Vanderbilt University in Nashville. He says these outbreaks are a tragedy because "measles is a really bad disease." He tells his medical students at Vanderbilt that before there was a vaccine, 400 people would die each year in the United States from measles. Schaffner, who is also the president of the National Foundation for Infectious Diseases, says even the remote areas in the Amazon have well-functioning immunization programs, which have contributed to measles being eliminated from the Western Hemisphere. "The only measles we have in the Western Hemisphere is imported," says Schaffner and he faults the Europeans for being "behind some of the developing countries in their commitment to measles elimination." If one country has an outbreak, measles can easily be transferred to another country by travelers. Martin says that the big outbreak in Bulgaria started with a case that came from Germany to Bulgaria. Another example on the WHO website describes how a 9-month old child in the U.S. contracted measles in the Dominican Republic, most likely due to the exposure to an adult from Europe. According to the Centers for Disease Control and Prevention, about one out of 1,000 children with measles get inflammation of the brain, and one or two out of 1,000 who contract the disease will die. Martin urges people to get vaccinated and get vaccinated on time according to the vaccine schedules of the country you live in. In the U.S., the CDC is urging parents to make sure their children are vaccinated before traveling abroad. A child gets his or her first MMR shot between 12 and 15 months of age and then another shot at about age 4. But if you are traveling overseas with a 6- to 11-month-old baby, the CDC is now recommending these infants should get one MMR shot to get some protection. Schaffner calls this the "travel dose," but adds that this does not replace the regularly scheduled measles vaccinations – this child would still need an MMR shot between 12-15 months and before the child enters pre-school, around the age of 4. First! Yay! But seriously, vaccinate, vaccinate, vaccinsate! Your life is worth it! It's really questionable which is more dangerous, the disease or the shot itself. The government is so unsure themselves that they shield vaccine manufacturers from liability, because apparently there is great risk otherwise why shield them?. Oh, and doctors love to cook the books... If you get a measles vaccine and then get measles, the doctors just label "measles" something else in your case because you got the vaccine, so of course you didn't actually get measles when we all know vaccines are perfect (not). @accorn – no, it really, really is not questionable which is more dangerous. Complications from vaccinations are exceedingly rare while serious complications and even death, particularly in children in countries with less access to health care, from measles are all too common. Right only people who are already sick & don't have healthcare or food or clean water die from benign illnesses like measles. If your children are healthy and live in the United States getting measles isn't going to kill them. A lot of things can kill you if you already have a weakened immune system. Measles RARELY kills or even causes serious injuries for healthy adults or children! It states right in this article only 400 people died per year in the US of measles BEFORE there was a vaccine. 40,000 people die every year in car crashes in the USA. Stop spreading this nonsense about how horrible measles is and what a killer it is. It is simply not true! Do vaccinate!!!! You know why – there is no sound scientific connection between vaccination and autism, but there is lots of scientific research actually proving that those vaccination/autism studies are total crap and were either falsified or were not properly done (missing controls or by wrongly using certain techniques like PCR). So, you people better take care on time and don't trust something seen on TV and to sleep better – well, ask questions – it is your right as a patient to know! Check this out, let me know what you think. Thanks to the morons that perpetuated the lie that vaccinating causes autism. This one is on you. Granted sure if one is too young to vaccinate nothing can be done, but those of age and not vaccinated due to whatever foolish reason, this is your fault. Yes, and those too young to be vaccinated get it from older children or adults who weren't vaccinated. the palin stupids that aren't getting vaccinated are putting everyone else in danger. the more people that contract measles the greater chance it mutates. thanks alot u morons. I regret that young ones get and sick from this preventable disease and I hold parents responsible for this. But, Nature may be just cleansing the Gene Pool of those adults who are just too damned ignorant to get immunized. If vaccines are so safe you might ask your government why they shield the vaccine makers from all liability. Kinda strange to have an insurance policy when at the same time claiming there is no reason to. Yeah, it's really moronic to think that injecting known toxins directly into your bloodstream might have bad effects..
FYI the autism theory hasn't been debunked, only one study has been debunked. Learn some science. Vaccine manufacturers are shielded from liability because Americans will sue for anything that goes wrong, whether justified or not. And that one study on vaccines and autism caused a worldwide panic over vaccines. I absolultly agree – there is no sound scientific connection between vaccination and autism, but there is lots of scientific research actually proving that those vaccination/autism studies are total crap and were either falsified or were not properly done (missing controls or by wrongly using certain techniques like PCR). So, you people better take care on time and don't trust something seen on TV and to sleep better – well, ask questions – it is your right as a patient to know! Don't we need a cleaner planet for over-all health well-ness? Why is our planet so dirty both on inside and outside? Are medical personnels speaking up about it? Or do they believe humans can live healthily in a garbage dump? Viruses have been around as long as there has been life. They aren't caused by filth, though they may thrive in an unclean environment. it has MUCH less to do with environment being dirty and WAAAAAAAY more to do with people being gross beings who wouldn't know how not to contaminate something if their childrens lives depended on it. cover yer darn mouths people! Young people have to catch it from somewhere, and it's not always from other kids. It's called herd immunity: If 99% of people are vaccinated, any one case won't spread, and even the 1% of unvaccinated people are probably safe. If only 95% of people are vaccinated, there's more chance that a single case will spread, and each individual unvaccinated person has much greater risk. Unvaccinated adults are directly responsible for the deaths of these children. "Airfares to Europe are quite enticing at the moment, but traveling to that continent could introduce you to more than just the sights"
But if you are vaccinated then does it matter? Vaccines don't always work. Interesting how most people assume they always do, but no just because you had a vaccine doesn't mean you are 100% safe. And then the unvaccinated come here and have measles just like those two French women on tonight's news. It should be noted that we had a measles outbreak in Salt Lake over the last couple of weeks, thanks to some people who traveled to Poland with their unvaccinated kids. Thanks for bringing back preventable diseases, idiots (and, no, no universal health care in Utah). Well done, Brian – you managed to bring up something that's completely irrelevant to the article, simply to make a misguided, uneducated political point. Yay for Brian! Brian, did you even read the whole article? It said the measles spread in populations that do not have access to health care or people who refuse vaccines. It has absolutely nothing to do with universal health care. You should think first before you speak, it would have saved you from looking stupid right now. Well done. Spoken like a true American. Brain please stop being stupid. You obviously know NOTHING about national health care. I am an American living in Germany and here ALL children get FREE health care including RX AND vaccines, plus unlike the poor children in America on medicad and other such programs poor kids here can go to the same Dr.s as the rich kids. In other words we have NO NETWORKS. As an adults my husband and I PAY for our health care just like we did in America. So all in all children are better taken care of here than in America. Do you know anything about the ROMA? They are the ones spreading disease. (and people from the countries where good health care is not yet available.) I would also like to ask others on here living in Europe to share with Brian about your health care systems. Brian please think before you speak. Yeah, because there is a huge measles outbreak in Canada too. Salaam sis,Oh dear, inshaa Allaah He will proetct baby from the disease. Take care dear sis.La ba'sa tahoorun inshaa Allaah – may it be a source of purification for you, if Allaah wills.May He ease our affairs, ameen..
measles don't kill people. unvaccinated retards who got measles and passed it on to babies kill people. Measles outbreak? Zut alors! Aren't those snotty elitists on the east side of the Atlantic always bragging and carrying on about how much *better* everything is in Europe? Yeah, the thing is, everything is, um, better over there. Sorry 'bout that. Just the way it is. I moved to the US from Europe, it is better over there. Can't wait to get back, you can have your crappy country. Hello measles is a telrrbie problem amount us specially the children a lot of parents have the initiative to get the vaccination to their kids cause this problem can become mortal and is super contagious around America and this initiative have same thousands of lives in a decade.so if you can help us with the measles initiative please help , lets protect the kids . Finally a voice of reason. Measles is really not that dangerous. Ow, I must have imagined when it said in the article that the measles is very dangerous and people have already died. Silly me. @tutu Did you also read that only 400 people died every year from measles BEFORE there was a vaccine? Please don’t feed into this hysteria. It’s just a scare tatic to get people to make the pharmaceutical companies richer so they can contribute more money to the politicians. As many children under five drown in swimming pools every year as adults & children who used to die the USA of measles before the vaccine. There are much more dangerous things to do with your children then not get them a measles vaccine. Like drive with them in your car! Measles is rarely ever fatal for serious for a healthy adult or child. If I remember correctly, measles can also cause blindness, deafness, and a few other little undesirable side effects without killing. Feel any better, Claire? @moodymoody Yes I still feel great about what I said. The instances of any serious complications are so low that you should be more concerned about the side effects of the shot then death or disability by measles. 40,000 people die in car crashes every year & thousands more are disability. Measles even before vaccines only killed 400 people a year & left an equally small percentage with any life long health problems. As long as you live somewhere with clean water, lot's of food & good hospitals measles is not a grave health concern. Myself & my siblings had it & no ill affects. It is extremely irresponsible to not vaccinate your children. Why run the risk of infecting or killing another child/ your child, when you can save lives by vaccinating. Totally blaming this on that shady scientist that told parents vaccines cause autism, rather than genetics and chance. Ridiculous. Agreed that vaccines are important, but there are side effects sometimes. I can't blame a mother for caring. That's almost saying we should feed every child peanut butter because it's good for you. What does this have to do with vaccines? Because peanut butter IS NOT FOR EVERYONE and some are very alergic to it and we don't find out till after the fact. Here's another fact, PEOPLE DO DIE AND GET VERY ILL FROM VACCINES! Am I anti-vaccine? NO. But this one size fits all nonesense needs to be dropped. What about the shady studies that say that it doesn't cause autism? Look up the charges against scientist Poul Thorsen. @ Rob- I can agree to that, but most parents who don't vaccinate do it for other reasons other than their kids being allergic to them. As a person who gets vaccinated regularly, so to protect the kids I am around, its the accountable thing to do. If I were a parent and I didn't vaccinate, I would hate for my kid to catch something and pass it on to another and they die because of my "personal choices". @ Claire- Poul Thorsen is a cheat and a liar, but that doesn't detract from Andrew Wakefields short comings. He purposely skewed his original study, in order to appease parents and gain money. Either way, there is an overwhelming evidence that vaccines help rather than hurt. "Measles vaccination resulted in a 78% drop in measles deaths between 2000 and 2008 worldwide." (The World Health Org.). Just putting that out there. . .
@tutu Did you also read that only 400 people died every year from measles BEFORE there was a vaccine? Please don't feed into this hysteria. It's just a scare tatic to get people to make the pharmaceutical companies richer so they can contribute more money to the politicians. As many children under five drown in swimming pools every year as adults & children who used to die the USA of measles before the vaccine. There are much more dangerous things to do with your children then not get them a measles vaccine. Like drive with them in your car! Measles is rarely ever fatal for serious for a healthy adult or child. So you admit he's a liar and a crook but still believe that all the studies he was involved in are still rock solid and shouldn't be questioned? He stole 2 million of the grant money he was supposed to use to disprove the connection of mercury in vaccines to autism to buy a mansion, motorcycles & vacations. However, you still believe the studies are good & there's no way he might have also been bribed to falsify the studies by the people that stand to lose millions if not billions through loss of revenue & the lawsuits that would be filed if there was proof. The CDC used 5 major studies to decide autism couldn't be linked to vaccines & this "liar" was involved in three of them. @ Claire....again- He wasn't the only scientist involved in studies that offer validations for getting vaccinated. Your talking about one dude who is getting press and not an entire scientific and academic community that has done studies too. Your looking at one man, who hardly represents the majority of the international scientific community. Use whatever excuse you want, there is more evidence for vaccines than against. Measles are the No. 1 killer among children around the world, according to the WHO. I believe, personally and obviously offensive to you, that vaccines work for a majority of people and prevent disease. As a babysitter, I am not willing to pass anything to any child I watch and I would hope you would not let your children around other kids who aren't vaccinated. Just because you haven't lost someone due to not getting vaccinated, doesn't means it doesn't happen to others- you can live with that guilty, but I am not certainly not willing to do that. I find it hypocritical that pro vaccine adults that think every child should be vaccinated are not vaccinated themselves. But I expect that since it's easier to force it on a child than themselves. Cowards. Kind of like religion. How do you know those parents are unvaccinated on purpose? You don't, it doesn't say anything like that in the article. A vaccine is not a 100% guarantee or the parents don't even know they are not vaccinated since their parents might have screwed up and not told them about it. Everything is just speculation, exactly like your remark. My friend's 2 year old just had measles in SoCal and he's fine it really wasn't a big deal. My siblings and I had it when we were kids and it wasn't that bad. Only 400 people a year died from measles in the US before there was a vaccine for it? That's not very many people. About 350 kids under 5 drown in swimming pools every year. 2,400 children are run over by SUV's every year and about 100 of those die. What is the big deal about measles again? Most people who get measles do not die or have any lasting affects from having it. Totally agree! Here in Germany parents are even having measles parties to get their kids exposed. The vaccine has proven not to be 100% effective, but once you have had the measles you can never get it again. Maybe they should report correctly on the majority of kids that are getting the measles here and dying from it are ROMA. enough said. Of course I'm a parent & my children are not vaccinated just like I wasn't & just like my parents weren't before me. My siblings also do not vaccinate their children. All of the 400 people who died a year from measles before the vaccine weren't children many where adults. 40,000 people die in car wrecks every year. I suppose you think everyone should get vaccined and start walking everywhere then? Do you have any idea how small a percentage 400 people out of our entire nation is? How would you feel if one of your children was one of the rare children to die or be permanently disabled because they WERE vaccinated? I'm no troll I just refuse to sit back & let other people instill fear in the minds of everyone that has no place being there. People who decide to not vaccinate for measles are still 10 times more responsible then people who decide to drive around with a child in their car if we go with your rational. More blood on Wakefield's hands. LOL! You obviously haven't heard about the charges brought against Poul Thorsen this week! As a European, I know nobody who is not vaccinated. Those who refuse are either fundamentalist christians, islamists or hippies. If Palin promotes refusal of vaccination, you know in what kind of ballpark she is. Measles requires a 90% vaccination rate in the population to confer herd immunity. Not vaccinating yourself or your children against Measles puts others at risk. People don't realize that Measles can KILL. There is no cure for measles aside from supportive care, and it is so easy to prevent. A lot of things can kill you if you already have a weakened immune system. Measles RARELY kills or even causes serious injuries for healthy adults or children! It states right in this article only 400 people died per year in the US of measles BEFORE there was a vaccine. 40,000 people die every year in car crashes in the USA. Stop spreading this nonsense about how horrible measles is and what a killer it is. It is simply not true! Throughout history, infectious diseases were one of the biggest killers of humans. Vaccines have saved (and continue to save) thousands of lives every year. Vaccines are very safe, and quite effective. Vaccines rely on your immune system's ability to produce antibodies to protect you from the disease. A small percentage of people don't fully respond to the vaccine, but they're still better off than not getting vaccinated at all). The fact that some people don't take infectious diseases seriously is a testament to vaccine effectiveness in modern times. the risks of the vaccines. measles is not one so bad the benefits outweigh the risks it has never has been one of the great killers. Also, those people who do not develop antibodies even after vaccination are not any better off then someone who has not been vaccinated. "Those people" might develop some antibodies, and although not fully immunized, it will reduce the severity of the illness. That is really not accurate James. The majority of people who don't develop antibodies to a vaccine aren't kinda a little immune like you're suggesting. They aren't immune at all. Also, vaccines like Hep B often given at birth wear off within 5 years or so. I am not exclusively anti-vaccine. However, 10 years ago babies under 15 months old only received 7 shots & now they receive 21. I question the safety and necessity of adding on 14 additional shots to an infants vaccine schedule. Many parents are still vaccinating but on a selective alternative schedule. They base their choice on what illness are of my concern where they live & their travel habits. It seems responsible to me to educate yourself & question every thing that is injected into your children. Also I completely agree that poor diet leading to childhood obesity & diabetes is a much greater concern & epidemic then measles! People blindly vaccinate their children & think this is the answer to all the childhood illnesses in the world & then feed them junk food. Some people are so quick to find excuses to avoid vaccines, and many don’t give a second thought to what they’re eating at a fast food restaurant (for example). In the grand scheme of things, modern society faces a major health threat from chronic diseases due to overindulgence and lack of exercise – diabetes, heart disease, stroke, high blood pressure, etc. Vaccination is a very logical decision to minimize the risk of infectious disease, but likewise we should pay attention to other health-promoting behaviors. Recently I overheard a group of dog owners discussing the details of their dogs’ diets and activity regimes. I was struck by the irony that the dog-owners themselves were grossly overweight and out of shape. I guess we tend to over-emphasize some things and arbitrarily overlook others. Hypocrisy is rampant when it comes to offers of health advice. That is a wonderful observation and very true, but I on the other hand think most people who are conscious enough to question the vaccines that go into their children are usually the same people who care about what they eat. You'd think the government who care more about the epidemic of obesity in our country then the very slim chance measles can kill you! diabetes & heart disease now those can be real killers! Definitely. We must realize that vaccines can only try to offer protection against a handful of infectious disease threats. They can't save us from ourselves. People who blame Wakefield for this are absolute morons. First of all Wakefield NEVER claimed the MMR caused autism. Second, the GMC never disputed his scientific findings, nor did they claim he modified his results. That claim was only made by a 2-bit journalist, Brian Deer who is a proven liar, having lied about him being the complainant to the GMC and having used a false name to interview a parent. Furthermore, there is NO Wakefield affect. The incidences of measles WENT DOWN in the years following the Lancet paper. OK anything else ridiculous that you would like to espouse? Even if you're not concerned about the severity or lethality of a particular disease – please get vaccinated so that you won't be a carrier of the illness and spread it to someone more vulnerable.